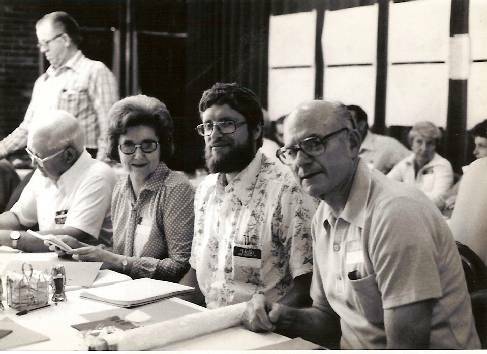 The following was written by Marion Shirley of Indianapolis, Indiana in 1979 about our first Shirley Convention. "Are you holding a reservation for Shirley?" The good natured Mr. Sharp, manager of the Holiday Inn at Hopewell Virginia barely blinked before asking, "Which one?" 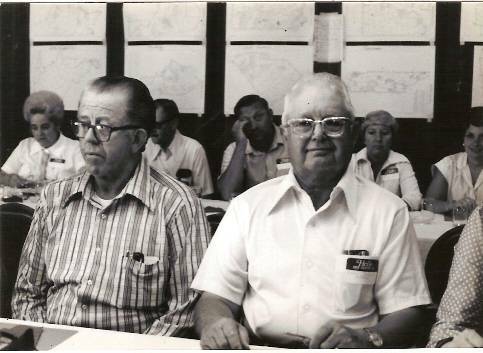 The first Shirley Convention was not in the least deferred by the gasoline shortage. Forty-three Shirley's from fourteen states converged on the Inn by auto, air and motorcycle; and enough of us had arrived by Friday evening to start getting acquainted. ("How do you do. I'm not a Shirley-- I'm just an 'outlaw'. ") Pen pals met each other face to face while Betty and Guy moved graciously from group to group and then to their preparations for the next morning's meeting. Sharing of family notes and pictures began seriously and was resumed during every spare moment through out the week end. Striking family resemblances were noted too often to be coincidence! 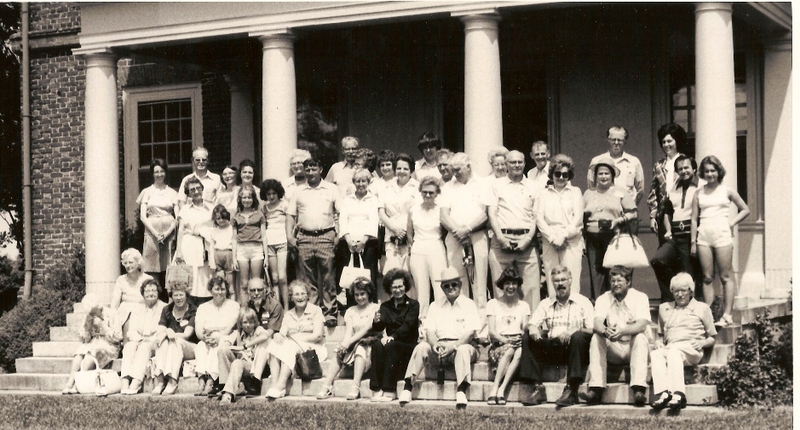 Saturday morning, Betty asked us to be seated by lineage -- the Walter Shirley group, the Kentucky Shirley's and the other Shirley descendants. We munched on California Bing cherries, compliments of Betty and Guy, while formally introducing ourselves. 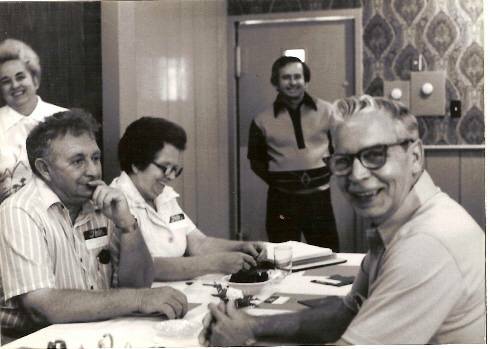 (My husband Walter said, I'm descended from the Barren Co. KY Shirley's and I'll turn you over to my mouthpiece--my wife." Marion) --Obviously the the so called "outlaws" play an important role in the Shirley Association!). [I THINK MARION MAY BE REFERRING TO THE FACT THAT I TOO AM AN OUTLAW...JUST MARRIED INTO THE FAMILY]. We learned more about our common English ancestry from an enormous wall chart arduously prepared by Betty. In addition, she announced that a limited number of these charts and books, containing relevant portions of the "Stemmata Shirleiana", are now available. Mr. Hill Carter, present owner by descendancy of Shirley Plantation, climaxed the morning with a capsule history of the land--starting with the foundation of the "West and Shirley Hundred" in 1610, and capping it off with Louisa Carter's breathtaking eyewitness account of events at Shirley during the Civil War when the plantation was protected by the Union against destruction by both sides. He concluded by reciting from memory two letters to the Carter family from Robert E. Lee, whose mother was a Carter, written after the Civil War. Mr. Carter's presentation was a sober reminder that Shirley's lived on both sides of the Mason Dixon line and leveled guns at each other as we so often hear, that families were divided by the terrible war. After lunch we went by caravan to visit Shirley Plantation. Carter's personal attention to the historic significance of the house and surrounding lands, and the beauty of the gnarled old walnut trees on the banks of the James River was most interesting. If our group picture taken at Shirley reflects emotions other than interest and pleasure--such hilarity or suspense, these reactions were the result of watching the photographer sprint to position in the picture after setting a delayed shutter release! We reconvened later in the afternoon for more ancestral-record swapping and an informal buisness diescussion which dealt with such mundane matters as the format of the Shirley News; Betty's deficit (she does have one! 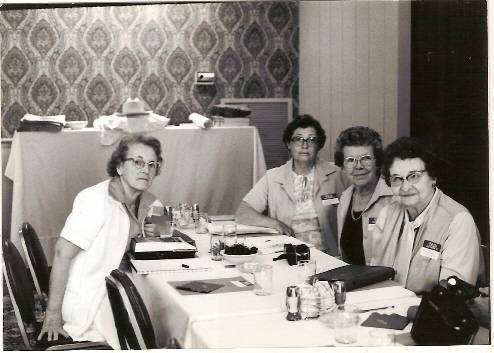 ); the necessity for accuracy and authenticity in reporting our genealogical information--documented whenever possible and ways and means of broadening our association membershipd and general interest in active research into Shirley history. Looking forward to a growing interest in Shirley relationships, ancestry and future Shirley gatherings, we all sensed a warmth and congeniality which can only bear out the truth in the old addage that blood is thicker than water. Guy is handsome, personable and modest. His ancestors start in Pennsylvania, move on to Ohio, to Arkansas and finally to California where he is now in the construction business. 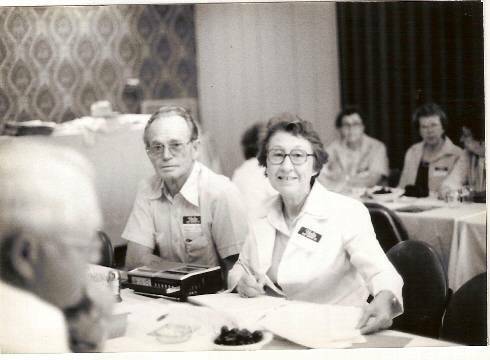 He gallantly bowed to Betty's leadership at the Convention but was a tireless, informed partner and host, a necessary ingredient in our first conclave. Betty is a woman with one gear; "Full speed ahead!" A mover and an organizer, she has conducted a successful bridal service including everything from the engagement to the last grain of rice. She recently became interested in her own family origins and moved on to Guy's family and Shirley's in general. 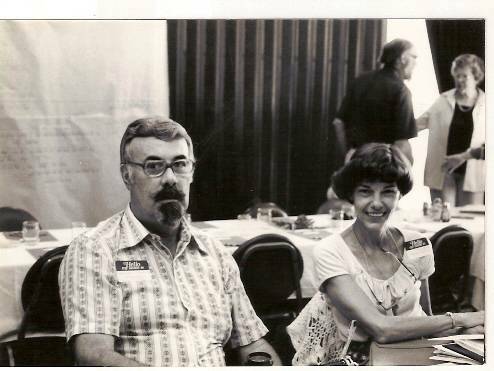 Her ambitions for the Shirley Association together with her organizational abilities encouraged us to believe that we cannot only enlarge our membership and scope of research, but have fun doing it. It was fun to meet Betty and Guy and their two youngest daughter, Delaine, 15 years, and Debbie, 12 years. Marion's husband, Walter, passed away several years ago. She remarried and lives in Florida. She is now Marion Porter. I hear from her every few months. She provided the Smith info that we posted on our surname web page about a year ago. 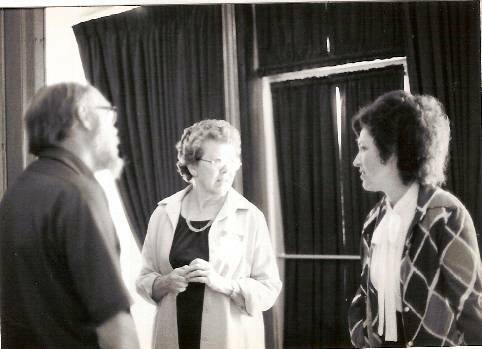 Marion and Walter attended several Shirley gatherings over those earlier years. Marion also went to England with us in 1986. Marion... a note to you! Typing this took me back to those early days. I've been thinking about all the great friends we have made over the years and how many of them that are no longer with us. I am so pleased to have met them and to have learned of their family info. Marion, this was one of the best things I have done in my lifetime. I had no idea how long we would do this NEW Shirley Association thing. I guess I have surprised myself. It's been fun!